Dec 17, PURI, ORISSA (SUN) — More on Lord Jagannath’s Veshas (costumes). Orissa is glorious and boastful because of presence of Lord Jagannath at Puri. He is the Bada Thakura, the Chief among Gods, His, temple is known as Bada Deula, the Chief temple among temples and the path in front of His temple is called Bada Danda, the Chief path way. The sea washing the shore of His Khetra is called Mahodadhi, which means the great ocean. 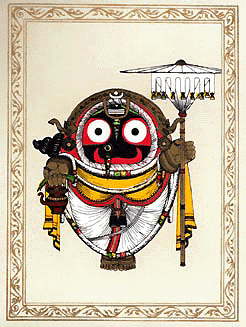 The food offered to Lord Jagannath is known as Mahaprasad. Hence His greatness cannot be narrated in words. To add to his greatness, the deities in the temple (Lord Jagannath, Lord Balabhadra and Mother Subhadra) are adorned with ceremonial costumes on various occasions throughout the year. These ceremonial costumes are 36 in numbers out of which 20 are considered most important. There are two Veshas, which take place outside the temple while the remaining 18 take place inside the temple on Ratna Bedi, where the deities take their seats. All these Veshas of the deities are linked with different events of His incarnations, the major Veshas relating to His incarnation as Lord Krishna. These Veshas draw the attention of countless devotees and visitors every year and the deities look so beautiful that one cannot retract his attention from the magnetic attraction of the eyes of Lord. The deities in the temple are decorated in three ways, that is by cloths, by gold ornaments and by flowers with Tulasi. Daily from Sunday to Saturday the deities are decorated with different colours of silk cloth, which represent the colour specified for that day of the week. The silk cloth used for this purpose is called Khandua, and is that on which the eminent devotee and Sanskrit poet Jayadev’s Gita Govinda verses are written. Sunday: Red colour of the sun during the dawn, who is the main planet of the day. Monday: White colour the colour of the moon who influences the day. Tuesday: Cloth mixed with five colours (Pancha rang Jodi) signifies Mars’s influence on this day. Wednesday: Green colour means the Mercury’s influence on this day. Thursday: Yellow or Golden colour, Jupiter’s influence is felt. Friday: White colour, Venus influence is felt on this day. Saturday: Black colour signifies Saturn’s influence on this day. On specified days, all these veshas are performed at night before the deities go to bed (pahuda). Bada Singhar Vesha means the dress of great divine love. Really it is an auspicious moment of the day. After paste of sandalwood is placed on His body and forehead (Chandan Lagi) the Silk Patas called (Khandua) on which His favorite Gita Govinda stotra is woven, are covered to decorate the deities. Gita Govinda and Dasavatar songs are sung by the devotees assembled at the moment. Along-with cloth dress, the deities are decorated with fragrant flower ornaments locally known as Adhara, Jhumpa, Gava, Kundala, Alaka, Guna, KarapalIav, Hrudapallav, Chandrika with Alaka Pati, and garlands. His daily Vesha is really attractive. One cannot realise it unless he sees this vesha. The Lord appears to be in a cool and pleasant mood at this moment. On the following early morning after lamp offering (Mangala Alati), the Bada Singhar Vesha done on the previous night are opened and a special type of cloth (Tadap) with white colour and orange colour border are used to dress the deities as They take bath in the morning. After bath, the deities are dressed with silk patta, gold ornaments and flowers everyday. Daily decoration of deities in the temple is performed by His Sevakas Khuntia Niyoga, Singhari Niyoga and Mekap Niyoga. Khuntia Niyoga is in charge of collecting flowers offered by the devotees and supplied by the temple itself. They hand over the flowers to Singharis. Singhari Niyoga known as Pushpalikas actually dress and decorate the deities with cloth, flowers and ornaments used for vesha on Ratnavedi. Mekap Niyoga is in charge of cloth and ornaments used for Veshas. They supply these to Singharis at the time of Veshas. January: On the full moon day of Pausa (Pusa Purnima) Deva Abhisek or Rajavesa is observed with golden ornaments. In this Vesha, the Lord appears like a royal king. February: (a) Padma Vesha is done on any Wednesday or Saturday between the new moon day of Magha and Basanta Panchami. Padma means lotus flower, the availability of which is remote in the month of Magha because of winter season. There is a legend behind this Vesha. Long ago, a great saint devotee of the Lord named Manohar Das desired to offer a lotus flower in this winter. Because of his Bhakti Bhava (deep devotion towards the Lord) it could be possible. From that day this Padma Vesha made of Sola, Jari, and Jhalak powder like white lotus flowers are used for decoration of the deities on Their heads and arms. A special type of pudding called Padma khiri is offered to the deities on this day. Only with this Vesha on Ratnavedi, the deities go to sleep and on the following day morning, after Mangal Alati, devotees get a chance to see this Vesha. (b) Gaja Uddharan Vesha is done on the full moon day of Magha. This Vesha depicts the Lord’s kindness not for human beings only, but for animals also. Once the elephant Gajendra, while taking bath in a river, was attacked by a crocodile. The elephant finding no other alternative prayed to Lord Vishnu to save him. Lord saved him by sending His Sudarsan Chakra. This prayer of the elephant Gajendra is known as Gaja Uddharan. This stotra has really a miraculous effect. One who chants before the Lord with devotion gets rid of his obstacles like an elephant gets away from the crocodile. This Vesha is made of Sola and the deities are decorated in a life-like manner. April: The 9th day of the bright fortnight of Chaitra is observed as Ram Navami, the birth day of Lord Sri Rama, an incarnation of Lord Jagannath in Tretaya Yuga. As lotus flowers are available in plenty, the deities are decorated with lotus flowers of white, pink, and red colours in addition to sweet smelling flowers. This Vasha is known as Rama Raja Vesha. May: From the 3rd day of the bright fortnight of Baisakh till 42 days (during this hard summer) the deities are decorated on Ratna Vedi with sandal wood paste mixed with musk and camphor and sweet smelling flowers available in the season. Alaka and Chandrika made of flowers are used to make this Vesha beautiful. To sooth Their bodies with cool air, the deities are fanned with a special type of fan known as Alata. June: On the full moon day of Jaista Purnima (Snan Purnima) the deities are decorated with a beautiful Vesha known as Gajanana Vesha or Hati Vesha. There is a legend behind this Vesha. Sri Ganapati Bhatta, a great devotee of Lord Ganesha from south India, came to Puri to see the Lord on this day of Snana Purnima. On this auspicious day he, however, he could not see Lord Ganesha on this Snana Mandap. He was disappointed. 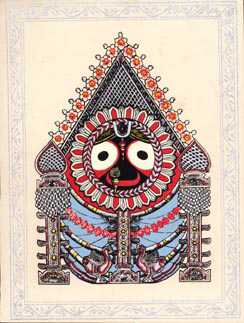 But Lord Jagannath is great, He is Antrayami, He could know the heart of His devotee. In order to appease the desire of Ganapati Bhatta, the Lord manifested Himself in the form of Lord Ganesha. Since that day, this Vesha is being observed on the day of Snana Purnima. July: On the 11th day of the bright fortnight of Asadha, the deities are decorated with gold ornaments on the Chariot during the Car Festival. This Vesha is known as Suna Vesha. This is one of the important and famous Veshas observed during the year and many devotees from all corners of the country used to come on this day to see the Lord on the Chariot with gold ornament Vesha. August: Jhulana Yatra, the festival of swings falls in this month (Sravana). All Veshas such as Banabhoji Vesha, Kaliya Dalana Vesha, Pralambasura Vesha and Krishna Balaram Vesha, which connect to the lila of the incarnation of Lord Krishna, are held in this month inside the temple on Ratna Vedi. The main attraction of this Vesha is that the deities are decorated with silk Pata, gold ornaments, and flowers of rainy season (Kadam and lotus etc.). September: On the 12th day of the bright fortnight of Bhadraba, Bali Bamana Vesha is celebrated on the Ratna Vedi. Lord Jagannath is decorated in such a manner that he looks smaller and dwarf like, which commemorates His 5th incarnation on this earth in which he defied the egoism of king Bali. October: On the 10th day of the bright fortnight of Aswin i.e. Vijaya Dasami (Dasehara), the Lord is decorated with Raja Vesha (in royal dress) with bow and arrow as in Ram Avatar. On this day he defeated the demon Ravana in Tretaya yuga. From 11th day of Aswin, Rai Damodar Vesha commences till the 10th bright day of Kartika (November). Rai Damodar Vesha means to celebrate the love of Radha and Srikrishna, during Krishna Avatar. From the 11th day of Kartika towards the last five days is observed as Panchaka and during this period the deities are decorated daily with different Veshas known as Laxmi Narayan Vesha. On 11th day, the deities are decorated with royal garb, golden ornaments, hands, and legs with Ayudha. This is known as Thia Kia. On 12th day, the deities are decorated with Banka Chuda Vesha. On the 13th day the deities are decorated with Adokia or known as Tribikram Vesha. On the 14th day the deities are decorated with Dalkia. This Vesha is known as Laxmi Nrshingha Vesha. On the 15th day (full moon day) the Raja Rajeswar Vesha is celebrated. These Veshas are mostly with gold ornaments. The deities are decorated occasionally with one Vesha known as Nagaryuna Vesha, when 6 days of Panchaka falls in the month of Kartik. This Vesha was observed in the year 1993. November: On the advent of the winter season, from the 6th day of bright fortnight of Margasira to the 5th bright fortnight of Magha, the deities are decorated with Ghoda Lagi Vesha, which means the bodies of the deities are covered with coloured woolen cloth specific for these days. From the decoration it can be understood that it is as if the deities are actually feeling cold. December: In order to pay homage to His parents (Nanda, Vasudeva and Dasaratha), the Lord puts on plain white cloth with a small yellow border to perform Shradha Ceremony on the 13th, 14th and 15th of the dark fortnight of Margasira. Through His various types of Vesha, the Lord delights the mind and heart of the devotee. The greatness of His pastimes is boundless whether God is decorated with Vesha or not; but His black face and eyes are the embodiment of all beauty and pleasure, which are unsatiable points for a devotee despite seeing Him for hours together. Bhagaban Mohapatra lives in Sarbodaya Nagar, Puri. Entry filed under: Uncategorized. Tags: India.